You can add the microwave oven to the list of products invented by accident. Dr. Percy Spencer was not trying to invent a faster way to cook when he discovered the principal behind the microwave oven. Instead, Spencer was working for the Raytheon Corporation testing a new type of vacuum tube known as a magnetron. One day, he discovered that a candy bar which he had in his pocket had melted while working with the magnetron. This led to many more experiments with the tube. The first two foods to be intentionally heated with the tube were popcorn and an egg. Spencer put some popcorn kernels near the tube and watched as the popcorn cracked and pop in the lab. Then, Spencer tried the experiment with an egg. The internal temperature of the egg rose causing it to explode when placed near the tube. To test his theory about the tube, Spencer created a high-density electromagnetic field by feeding microwave power into a metal box. The internal temperature of the food placed inside the metal box began to rise rapidly. Spencer and the Raytheon Corporation filed for a patent for a method of treating foodstuffs on October 8, 1945. 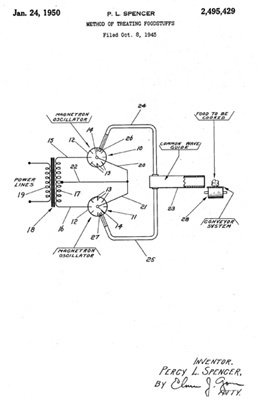 US Patent 2,495,429 was granted on January 24, 1950. During the spring of 1946, Spencer and P.R. Hanson were working on a secret project to perfect the microwave oven know as “the Speedy Weenie”. A microwave oven was tested in a Boston restaurant. Then, the first commercial microwave was built in 1947. The Radarange was almost 6 feet tall, weighed 750 lbs and cost about $5000. In 1954, a smaller version, the 1161 Radarange, was introduced but the cost was still between $2000 and $3000. The first microwave for use at home was introduced in 1967. The countertop versions of the Radarange sold for $495. Sales were slow in the beginning due to the high price tag. But as other companies began manufacturing their own microwave ovens the cost began to decrease. By 1975, the sales of microwave ovens had suppressed the sales of gas ovens. 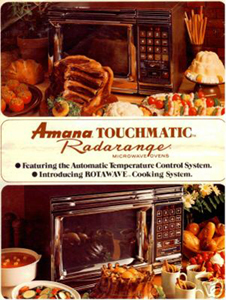 By 1976, 60% of all American homes had a microwave. The popularity of quickly cooked food has only increased since the introduction of the microwave. Today over 90% of American homes have microwaves.